The European Geosciences Union General Assembly 2019 is about to open its doors. 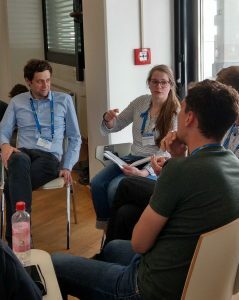 With less than two weeks time, we would like to provide a small guideline if you attend this EGU GA 19 for the first time and/or if you are an Early Career Scientist (ECS). We, that are your Geomorphology (GM) Division ECS Represenatives: Michael Dietze and Annegret Larsen, together with the ECS Rep team members Eric Pohl, Andrea Madella and Edwin Baynes. The EGU GA 19 is looming. If you are interested in the full story, here is a comprehensive 72 pages pdf version. A shorter, very condensed version, ideal for EGU first timers is the guide located here. 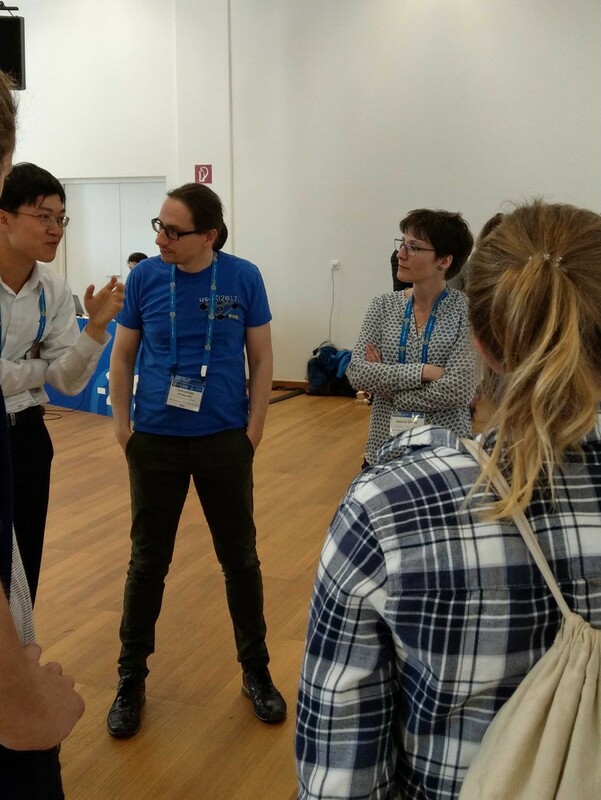 Your personal programme, which you should create via the EGU GA 19 website prior to the meeting, and which you should link with the EGU App on your smart phone, will be your main guidance. You can of course print the programme, but we strongly recommend using the App, for a long list of reasons. The meeting’s newspaper EGU Today will provide daily highlights of the Meeting, keep an eye on the online documents. Social media channels like the GM Twitter account and the GM blog will be vibrant during the meeting and provide you with updated information. The EGU badge will be your ID for the conference and your public transport ticket for the duration of the conference from Monday to Friday (8–12 April). Ideally, you have already received it via mail or you can pick up in the reception, opposite of the main entrance, during the Ice breaker on Sunday, or together with a looooong queue of people on Monday at 8 am. The EGU App will be a very handy item on your smart phone. It gives access to the entire program, all session details, allows scheduling and a lot of other fine stuff. It also holds the floor plans to prevent you from getting lost in the venue. Getting to the conference centre will be easiest by subway U1 eastbound to Leopoldau, exit Kaisermühlen-VIC. From there, just follow the stream of poster tubes. Try optimising the number of foot steps by finding the best entry points to the subway. Short course: How to navigate the EGU (Mon 8:30, Brown level, Room -2.16). If this GA is your first one, then that course is a must. Get all the essential information an looks behind the scene. GM Division Meeting (Thu, 12:45, Brown level, Room G2). This is the time and place when all your Geomorphology colleagues will gather to share information and make decisions. Lunch bags will be provided. There is almost no reason to miss this session, even if it collides with other scientific sessions. Medal lectures, Bagnold Medal lecture (Thu, 19:00, Brown level, Room G2) and Arne Richter Award (Mon, 16:15, Brown level, Room G2) and Penck Lecture (Wed, 12:45, Brown level, Room G2). All three lectures are enlightening and we shall do our best to honor the medalists. Meet EGU. If you were ever wondering who the GM division is, who your ECS Reps are and if there are questions you ever wanted to see being addressed, please find us (Tue, 15:45, EGU Booth, venue pathway). EGU Job Centre. If you are looking for a job or have a position to be filled, look here. Meet the Expert, an experienced scientist sheds light onto his/her trail to the current position, the detours and crossroads, with a personal flavour (Wed, 10:45, Brown level, Room -2.31). 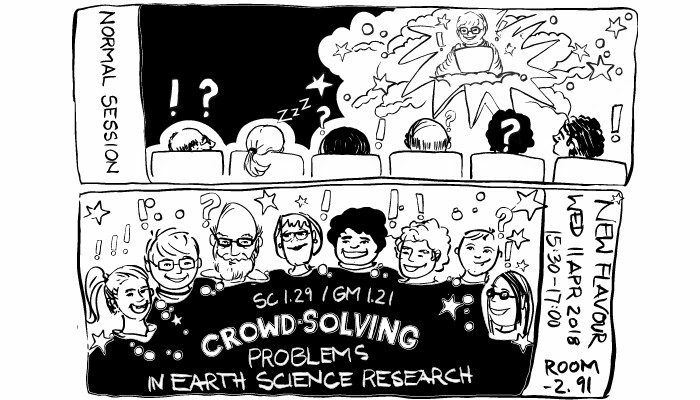 Crowd Solving Problems, after a perfect start last year, this workshop will continue bringing together young people to a special kind of ECS event (Wed, 19:00, Brown level, Room -2.62). If you are interested in further short courses, here is a list. Unsure about poster, PICO or talk presentation constraints? Here are some presenter details. Beyond these, please take care to staying in time (12 min talking, not more, 2 min PICO introduction). Be present at your poster, even if you also want to see other posters. Leave a note at other posters to catch up with the presenters. Take the things you did not like about others home with you as a rule not to make these mistakes on your own in the future, but always give constructive and friendly feedback. OSPP (Outstanding Student Presentation Prize) is a prize for ECS which will be given based on at least three reviews by more experienced scientist. Thus, make sure you are at your poster to be eligible and add the OSPP label to it (ask at the help desk or get it here). The review will be based on a set of criteria, including scientific relevance, timeliness, appropriateness of methods, sufficient background, aesthetic appeal, style of presentation. So make sure you address these points effectively. Bring your own water bottle (or buy an EGU one), avoid rubbish. 15000 people will create a lot of waste. You can do little bits with big impact. Tap water is of perfect quality, fountains and dispensers are available all over the place. Respect people’s privacy and the work they present. Ask them before taking pictures of posters or slides, take care not to take pictures of unnecessarily large groups of people behind off your focus. Take a look at the EGU photo/no photo policy. Behave at the drinks spots, please! It is charming, of course, but it is more charming to start discussing with other people, isn’t it? You will have plenty of opportunities to visit Vienna later on where the beer is very affordable. Keep service rooms and rest rooms in good shape. You can try to squeeze out the most of the session programme or stay alive even after days by taking breaks and not perform intra-session hoppings. You might think everything is over after the Friday afternoon poster session. Well, at least for GM things go on, even after the Friday evening. 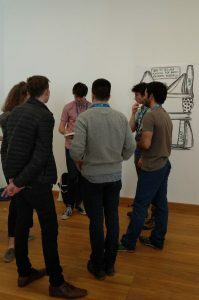 Steepest Descent is a workshop the Saturday after EGU, bringing together people devoted to Earth surface dynamics in a friendly atmosphere, with breakfast, coffee and lunch. Bring your poster to put it up and discuss during the workshop, again. Give feedback (last year: https://egu2019.eu/EGU2018_survey_results.pdf). It is so important to take a few minutes and digest what you have liked and what you would like to see improved next year. There will be an online form which allows you very efficiently to tell the EGU Programme Committee and Copernicus your feedback. Please help us with this. Consider running an own session or short course in 2020. 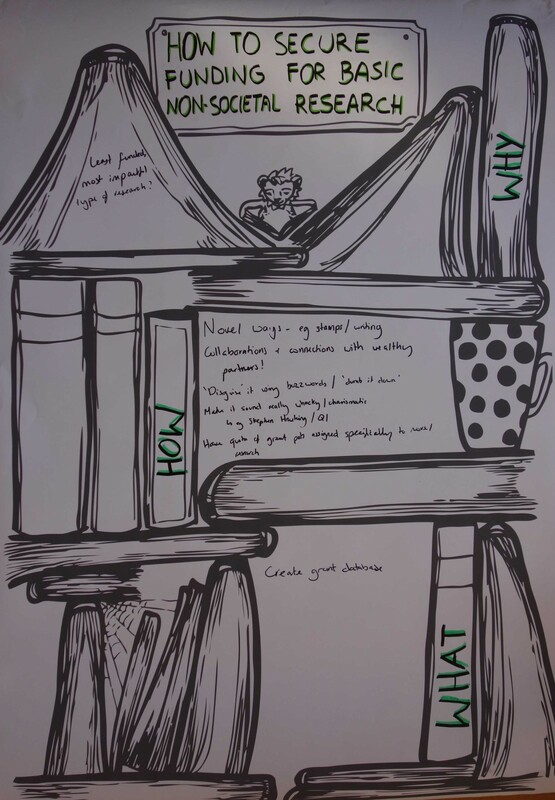 If you feel, organising and convening a session or short course would be a cool thing – it is! 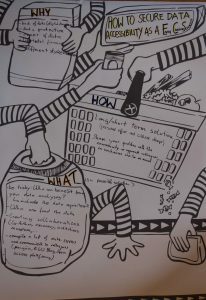 It exposes you to an interesting cycle of brainstorming, organisation, advertising, planning and interacting with people. If you think you want to propose an own session, do so keeping in mind the main rules and ideas. We hope this blog helps you ECS to have a better EGU 2019 experience. We are very much looking forward to see and chat with you in Vienna. Have a great time and fun with preparing your contributions. We are happy to announce the GSA Penrose Conference on Climatic controls on continental erosion and sediment transport (CLAST2019), 4-10 August 2019, Juneau, Alaska (USA). Key challenges remain in recognizing and reconciling how climatic and earth surface process mediate erosion independently of solid earth forcing. The relationship amongst climatic, erosional, and transport processes are exceedingly complex and arguably more intricate than those typically defined between erosion and tectonics. However, the study of these relationships is fundamentally problematic because many of these processes act both independently of and as a consequence of solid earth forcing. This conference seeks to discuss how climate can mediate the sedimentary record and under what conditions erosional signals can be observed and interpreted unambiguously in terms of paleoenvironmental and paleoclimatic change? Global Cenozoic climate, fluctuating sea level, and large-scale glaciation have pivotally affected our planet, from the physical evolution of mountain belts to the chemical breakdown of sediments distributed across margins. How do longer- and shorter-term climatic phenomena dictate rates of sediment supply and records of provenance? To what extent do environmental conditions mediate the periodic storage of sediments? Climatic control over sediment transport certainly extends to the offshore, so how do earth surface processes dictate the supply, loading, and stratigraphic architecture along margins and into the deep sea? And, under what conditions and timescales can precise and accurate climatic records be reconstructed from sediments? This conference particularly solicits contributions addressing erosion and/or environmental change from all earth surface process disciplines that permit robust correlation between changes in climate, erosion, and sediment transport. Separating drivers and processes continues to be difficult but are much improved in recent years as field studies are coupled with novel spatial and temporal control and further tested with dynamic landscape and stratigraphic models. This transdisciplinary meeting is intended bring together researchers across fields to showcase the current state of research, demonstrate contemporary evidence and methods from studies worldwide, and underline the research concerns remaining in our community. 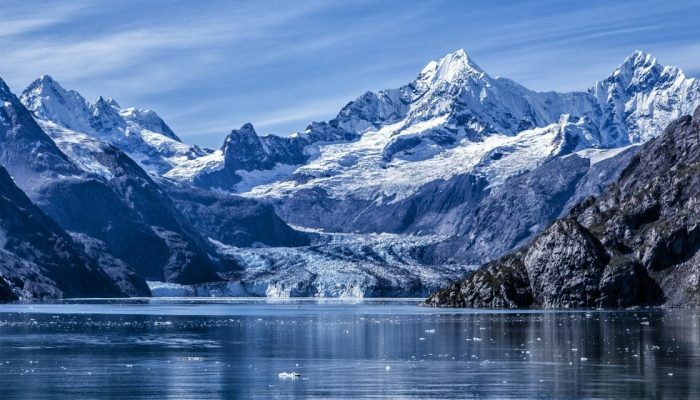 This seven-day meeting will start with an icebreaker in the evening of Sunday, 4 August 2019 in the city of Juneau, nestled within the Coast Mountains of southeast Alaska. It will end in fjordland, at the feet of Tracy Arm tidewater glaciers on the afternoon of Saturday, 10 August 2019. The meeting will balance between invited talks, roundtable discussions, pop-ups, and poster presentations, with two field trips occurring mid-week and on the last day. Registration fee is estimated at US$950-$1050 and will cover the cost of the meeting, hotel lodging for six nights, icebreaker reception, all lunches, coffee breaks, and poster refreshments, the mid-meeting conference dinner, and transportation and meals for the first field trip. The second field trip is optional; this cost is not included in registration and will be determined at a later date based on number of interested participants. Airfare is not included and participants must make their own travel arrangements. For more information and to apply to attend, please visit the conference website or download the detailed conference announcement. How to secure funding for basic, non-societal research? Perhaps one of the least funded, but historically most productive research areas is basic research, which at the time may appear to have little or no public impact, but often results in ideas and inventions that change history. In a world of ever reducing science budgets, securing funding and finding novel methods of funding research outside of grants, becomes the holy grail. You can write about your work for magazines who in turn cover your travel expenses, sell local stamps to collectors and even involve the curious public for non-mainstream projects. However, in reality, the majority of our basic research relies on grant success, and so the ability to write a strong application (hitting on popular paradigms like ‘climate change’). In that case the challenge is to find and access grants. So why not create an open access database for ECS, to both contribute and utilize for securing grant funding? 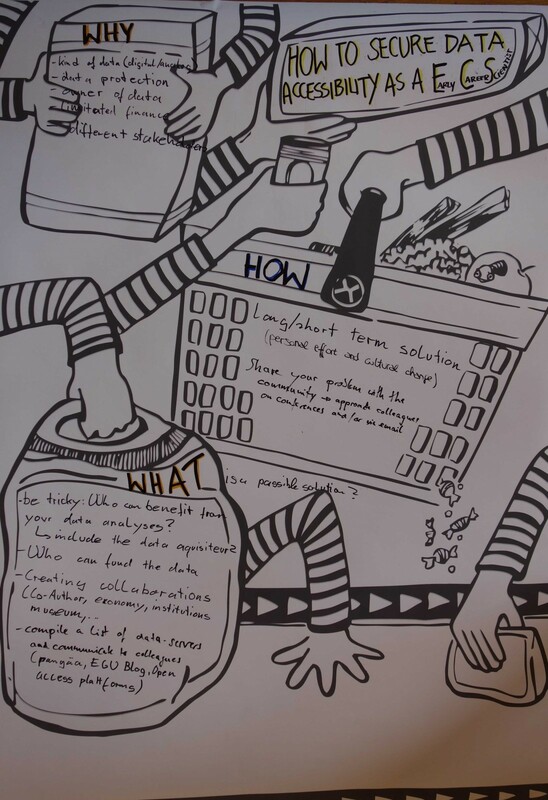 However, if you have tried and not found success with grants, hobby writing isn’t for you, and the idea of involving the public isn’t feasible, there’s nothing wrong with teaming up and collaborating with an already wealthier researcher! How to make measurement techniques affordable? 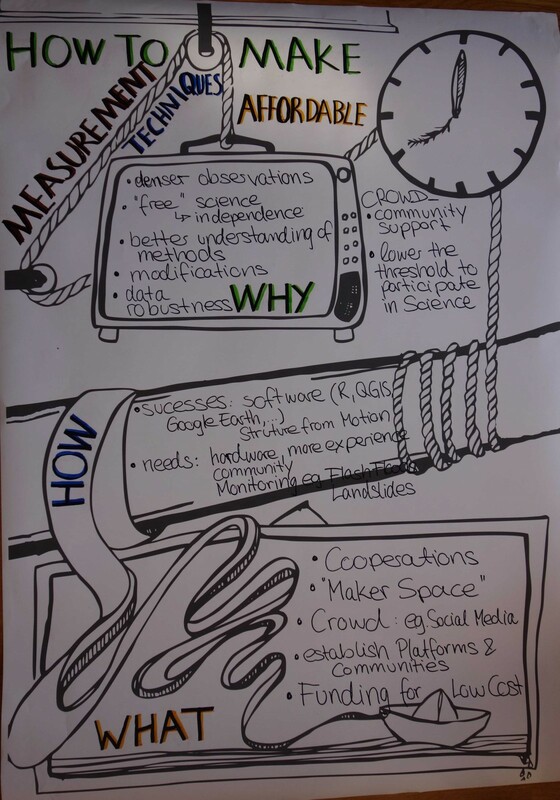 There are many good reasons to make measurement techniques affordable, such as fostering independent research, having low barrier easy access (financially, politically), increasing the quantity and density of data and thus robustness, greateningr knowledge of and possibilities to improve measurement techniques, and becoming more resilient if devices get swept away in monitoring hazardous processes… However, data quality and reliability need careful consideration, and data processing and analysis need automation to handle increasing data amount. Several examples associated with low cost solutions are already applied in earth science research; foremost are software solutions (e.g. R, QGIS). What we need for the hardware measuring devices is cooperative development of more low cost methods, big data handling and quality assessments. This could be realized in a “maker space” at universities, where scientist from different disciplines can gather to find joint solutions, or platforms and communities, such as GitHub for software. Therefore, the “crowd” and communication in this crowd could be a solution. In an ideal case, low cost methods were associated with a “crowd” supporting the application and development. Additional funding to promote in particular low cost methods should be provided. 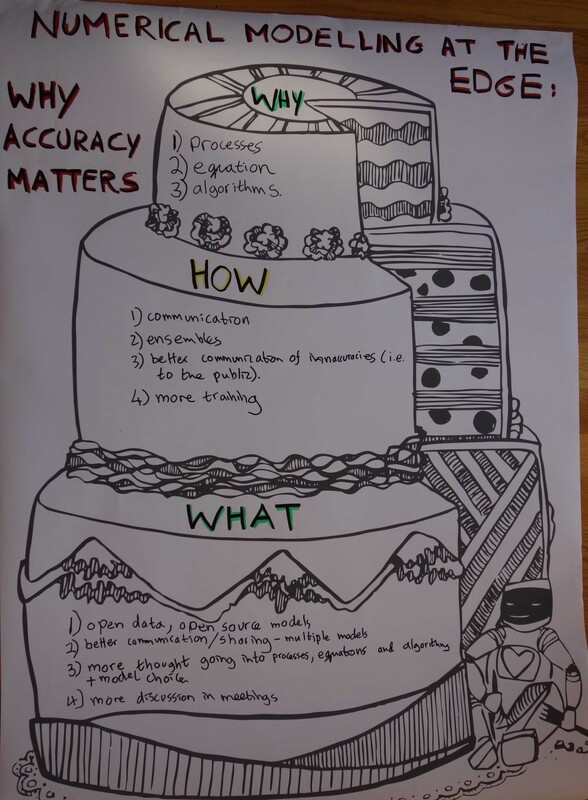 Numerical modelling at the edge: why accuracy matters? Numerical models are transforming our understanding of the world around us, allowing simulations of processes at scales impossible to investigate by any other means. Numerical models are simplifications or idealisations of ‘real’ environments and the accuracy of the model outputs is reliant on how well models represent this reality. Thus, while the possible complexity of numerical models makes them essential and ground-breaking tools for earth science research, they also cause some problems. First of all, how well do we understand these natural processes and how are they incorporated in the model design? And then, which equations and algorithms should we choose, ideally based on in-depth knowledge of natural processes? In this respect, interdisciplinary communication and exchange is required between modelers and field-based scientists in order to parametrize and grasp the physics of the natural processes. Practically we need greater sharing of ideas, open source models and data, to improve accuracy and help to understand errors surrounding model predictions. How to secure data accessibility as a young researcher? 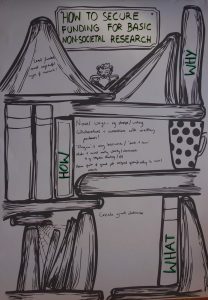 How to overcome the subjective nature of interpreting fluvial archives? Interpretations of archives and subsequent parametrizations for (numerical) models rely on subjects as well as the very individual and special outcrop site. 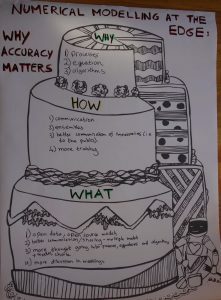 A first step could be to have the experience based tacit knowledge of a subject be translated into explicit knowledge, in order to make it accessible and comparable for other subjects (deduction). Combining the interpretations of several (interdisciplinary) subjects might provide a more objective, rigor and robust perspective. If enough parameters and proxies exist, we could also turn to statistics (induction). 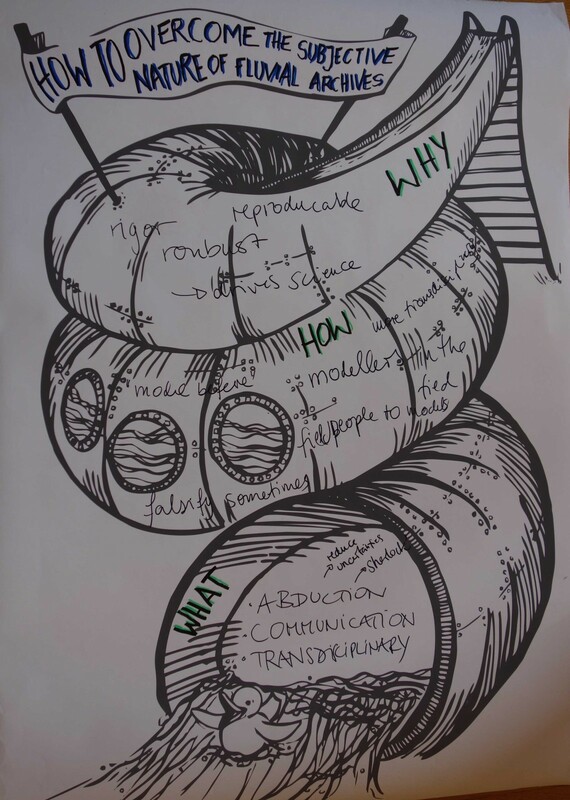 And if that is no option, we might try abduction, like Sherlock Holmes, where iterations of field/archive and model/statistics can, at least subjectively, make data collection more transparent, sharpen the interpretation and define further research questions. 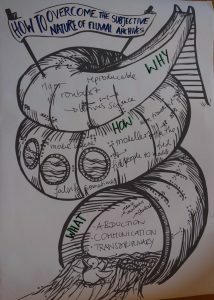 A synthesis solution to the question and the above stated challenges is: Communication. Obviously you can’t solve the challenges in 40 minutes, but the concept to spend more time for discussions on a conference to tackle the problems every scientists faces in this way or another worked. All five groups with roughly ten participants. Each came into conversation, exchanged experiences, analysed new aspects and developed ideas. We received very positive feedback from all participants and were encouraged to organize a similar event again – so maybe next year we can crowed-solve what the submerged part of an iceberg is called, anyway? The organization of this session was financially supported by the British Society for Geomorphologie and the Arbeitskreis für Geomorphologie. Welcome to the blog of the Geomorphology (GM) Division of the European Geosciences Union (EGU). This blog serves as a platform for the geomorphology community to share news, events, and activities, as well as updates on the latest research being undertaken in geomorphology. 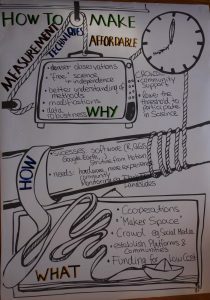 Everybody is invited to contribute to the blog and submit posts to the editors Jan Blöthe and Sabine Kraushaar. EGU – realm and maze?